I LOVE Mexican food. Nachos, enchiladas, burritos, and most especially HUGE taco salads. Obviously your traditional Mexican food isn’t all that healthy, so I have found ways to adapt certain dishes to make them healthier. My absolute favorite thing to do is build my own taco salads. Taco seasoned ground turkey or extra-lean ground beef, a ton of shredded lettuce, some fat-free refried beans, low-fat cheese, grilled onions and bell peppers, avocado, fat-free sour cream, and a few crushed baked tortilla chips. It’s a humongous bowl of yum and it tops out at around 350 calories. Anyyyyway, I had planned to make this dish a bean and cheese stuffed chicken breast, but I had a really long day at work and for some reason did not feel like dealing with rolling up the chicken. Therefore I came up with this idea. 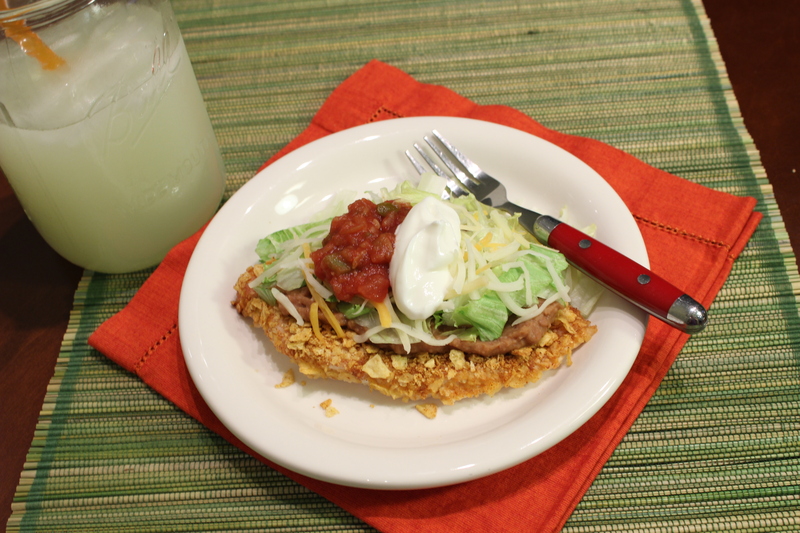 How about instead of a crispy tortilla as the bottom of your tostada, why not pound a chicken breast thin, coat it in taco seasoned tortilla crumbs, and bake until crispy and then top it off with all the other tostada fix-ins? My boyfriend said it was ingenious, but to me it was more about being lazy. Nevertheless, it turned out really good!! 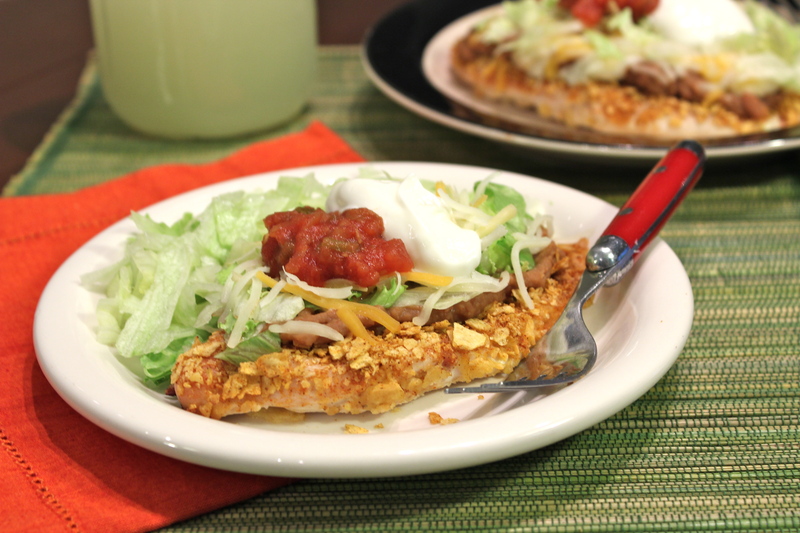 It’s just a glorified tortilla-coated chicken breast, but it’s brought to the next level with the taco seasoning and all the toppings! Oh… and remember how I mentioned I had a long day? That usually results in me breaking my only drinking booze on weekends rule and has me grabbing for my skinny margarita ingredients. 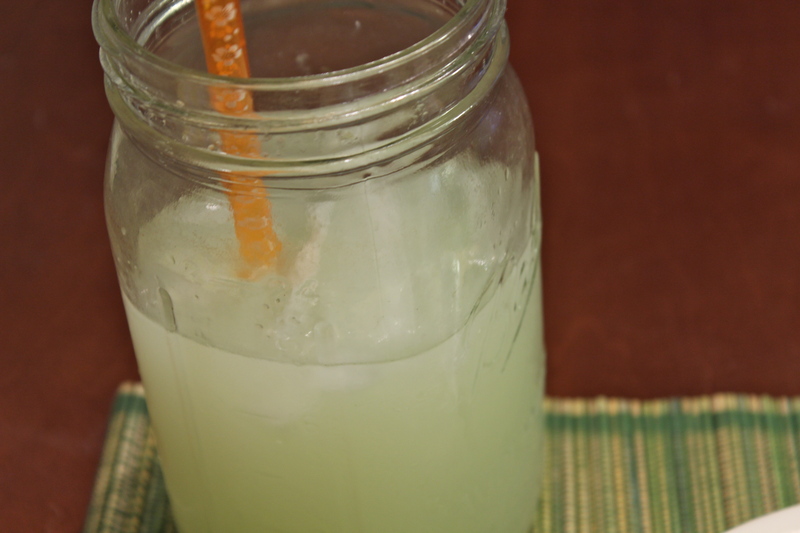 PS – if you like tequila, but don’t want to sacrifice the crazy amount of calories margarita mix has, try out a powdered sugar-free drink version. I have tried a few brands, but Target’s Market Pantry Lime Margarita Mix sugar-free drink mix is SO GOOD. And only 10 calories a packet!! Use 1 1/2 oz. tequila, BTW — another secret — COSTCO has the BEST silver tequila! Well, for the price that is. Not sure it’s going to top my Cazadores, but it’s $18.99 for a HANDLE. Get it! NOW. Ok — of on a tangent again. Use 1 1/2 oz. tequila, a can of diet lemon-lime soda, and 1 packet margarita mix. Stir, serve on the rocks, and relax! At least that’s what I did Oh — and that marg will only run at about 110 calories! Boo-ya — cheap AND low cal! I would say “winning” but then I would just be completely embarrassed seeing as I already said “boo-ya”… not sure where that came from. Alright, so make yourself a skinny marg (or 2 — I don’t judge) and whip up this simple and tasty Mexican inspired chicken dish NOW! Place pounded chicken breasts flat on baking sheet. In a medium bowl, combine taco shell crumbs and taco seasoning. Evenly distribute crumbs among top of chicken breasts and press into chicken to adhere. Bake for 20 minutes, or until crispy and cooked through. Meanwhile, warm refried beans in the microwave. 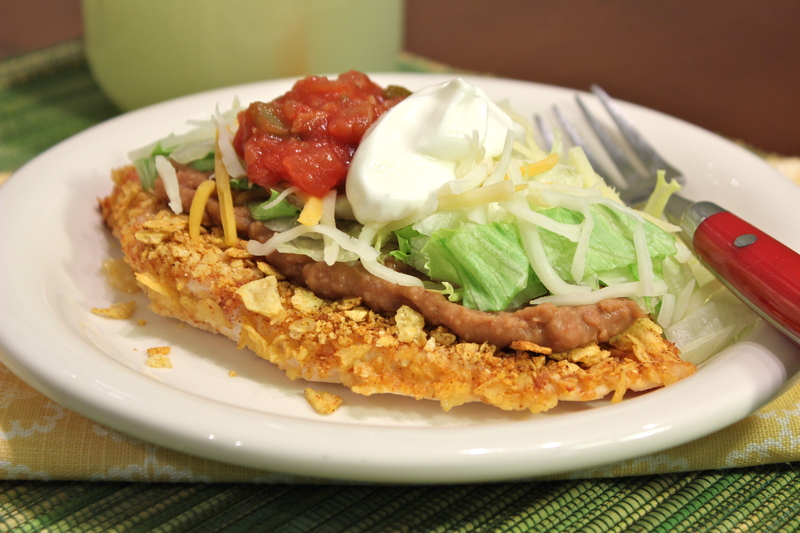 Once chicken is cooked, evenly spread each with 1/4 cup beans, top with lettuce, cheese, salsa and sour cream. 14 October, 2012 in Main Meals, Recipe Box.